(From left, back) Peter Jernberg, Pat Taylor, Keith Freeman, Lee Vance, James McGowen, Cliff Kling; (front) Eliza Lundy, Wesley Rule, Rocky Wilkins, and Matt Morgan. 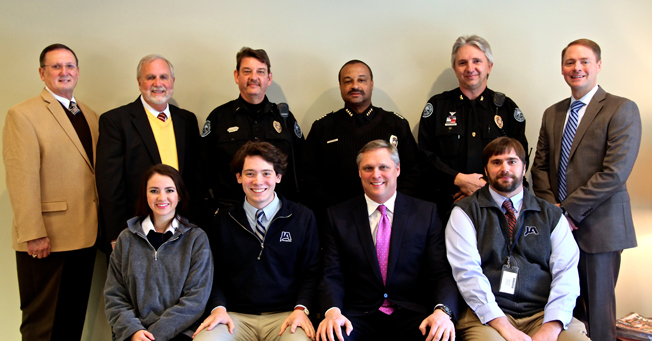 City of Jackson Police Chief Lee Vance and members of his team joined students, faculty, and administrators at JA for lunch and a tour November 19. Attending with Chief Vance were Precinct Four Commander James McGowen and Lieutenant Keith Freeman. The group discussed initiatives of the police department under Chief Vance’s leadership, as well as ways citizens could join with police to create safe communities. JA President Cliff Kling expressed his thanks to Chief Vance and the precinct officers for the work they do for Jackson. President Kling also commented on JA’s commitment to the City of Jackson, noting the school’s decision several years ago to remain at the Ridgewood Road location and invest in additional property and expansion.